Pour water into a 1 1/2-quart bowl to coat inside of bowl; pour out. Place bowl in freezer about 30 minutes or until ice forms. In 4-quart saucepan, heat 1-inch salted water to boiling. Add cauliflower. Reduce heat to medium-low. Cover; simmer 5 to 7 minutes or until cauliflower is crisp-tender. Drain cauliflower; place in ice water to stop cooking process. Drain well; set aside. In same 4-quart saucepan, heat 1-inch salted water to boiling. Add broccoli florets. Reduce heat to medium-low. Cover; simmer 6 to 10 minutes or until broccoli is crisp-tender. Drain broccoli; place in ice water to stop cooking process. Drain well. Remove bowl from freezer. In bowl, place row of broccoli with stems toward center of bowl; add row of cauliflower over broccoli, pressing florets to side of bowl. 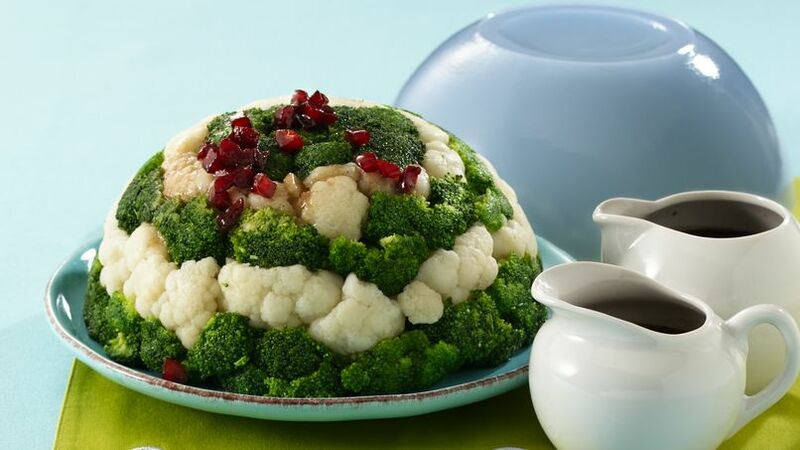 Continue adding cauliflower and broccoli, alternating rows, filling bowl completely. If necessary, drain and discard any excess liquid. Place plate over vegetables; press down firmly. Place heavy can (such as a 28-oz can of vegetables) on plate. Refrigerate at least 3 hours but no longer than 24 hours. Make soy dressing or red pepper dressing, or both, as desired: In small bowl, stir all soy dressing ingredients until bouillon dissolves. In another small bowl, stir all red pepper dressing ingredients until bouillon dissolves. Refrigerate dressings until serving time. To serve, carefully unmold salad onto serving plate. Carefully pour half of desired dressing on top. Serve with remaining dressing. Good for serving as a side dish with your favorite meat! And in your favorite occasion.